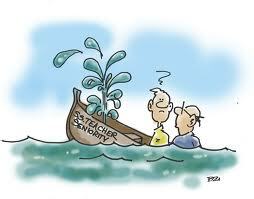 Seniority and tenure of teachers is becoming more and more a dead issue as thousands of teachers around the country are removed from their top-of-the-salary-scale jobs in total derogation of their contract and union rights by school districts trying to deal with huge budgetary shortfalls in something less than an honest manner. In accomplishing this under the pressure of ever tightening budgetary constraints, LAUSD is clearly engaging in a witch hunt where the fabrication of charges against completely innocent teachers is common place. Under the added cover of the Miramonte child molestation scandal the speed at which LAUSD administrators are being encouraged to target, charge with false charges, and removed perfectly innocent teachers has hit a rather feverish pace. Watch the following video and see for yourself. Feel free to comment below or get in touch with us at perdaily, if you would like to tell your own story. The very collective bargaining agreement that UTLA President Warren Fletcher & Co. pushed through the UTLA House of Representatives in December 2011 with a justification of false urgency is illustrative on the macrocosm of what you talk about on the microsm. If you not so closely read this document you will see that it is an illusory contract that makes obligations of teachers hard and fixed, while making the obligations of LAUSD, its principals, and other administrators subject to the discretion of these same administrators. Dare to question it and you are likely to be summarily removed from your teaching position and hit with moral charges under California Education Code Section 44939, which immediately leapfrogs over all your collective bargaining rights to grievance and arbitration- forget anything that even remotely resembles due process of law. I don't think the average teacher today realizes how much power the district and the union have given to local school leaders(principals) who have no idea how to use it fairly or effectively for the benefit of the school site. I recently had a wake up call in that I was one of the teachers who involved myself in every committee at the school, not to win favor but because I wanted to know what was going on. After participating on these committees that I thought were collaborative, I discovered that nothing we were doing meant anything since the principal frequently subverted and overruled our decisions claiming the authority and support of the local school superintendent. What a joke! No wonder many teachers won't participate on these shams. I personally feel stupid and gullible. How could I truly believe that any type of collaboration occurs in LAUSD. UTLA-WAKE UP!